Working fast means everything to Cargo Sprint. As a software toolbox that was founded in 2012, Cargo Sprint’s mission is to help alleviate airport congestion and streamline the payment and cargo pick-up process while enhancing customer experience. The company offers a suite of products designed to increase efficiency in the cargo industry. Cargo Sprint’s products allows cargo to move faster through the efficient payments to vendors and with less waiting times at cargo facilities. 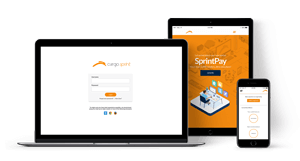 SprintPay payment platform was developed by Cargo Sprint to deliver fast payments to vendors. Adding Dwolla—to automate Cargo Sprint’s ACH payout processes—was the difference between walking and sprinting. Cargo Sprint Marketing Manager Alex Quintero says before Dwolla, payment processes were completed manually. Cargo Sprint didn’t need to work harder, they just needed a smart API solution to help them improve their processes. Instead of using a bank for a payments solution, Quintero says the amount of trust that the Dwolla team placed in Cargo Sprint as a startup gave them the confidence to integrate with Dwolla to improve their payments. “We were looking to move fast and bank processes take a little longer,” Quintero says. “Being able to work with Dwolla made it easy for us to automate processes much faster and work much more efficiently. Integrating with Dwolla made a great difference in the day-to-day work of Cargo Sprint, Quintero says. They were able to redirect a significant amount of time that was spent on manually processing and tracking payments and dedicate more time to developing product features and enhancing the customer’s experience. This has all led to the greatest benefit, Quintero says, which is gaining extra hands for extra tasks. Cargo Sprint has some of the key tools in place that it needs to continue to scale its business. As the number of customers and transactions grow, Cargo Sprint is looking forward to relying on Dwolla’s consistent pricing and diligent reporting through Dwolla’s dashboard data to plan for the future. With Dwolla as their payments solution, Cargo Sprint has no plans to slow down.